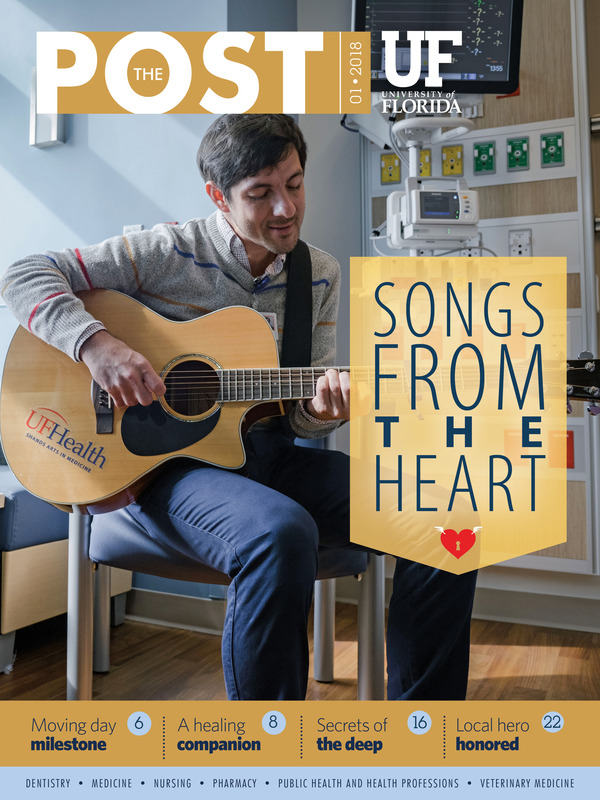 Florida College of Medicine, the leader of a research team and a busy mother. Thompson can now add a new title: She’s officially a hero. Last year, her research coordinator, Rebeccah Mercado, asked Thompson for her resume. Then, Mercado asked her for contact information for a couple of her patients. Thompson, an associate professor of pediatrics and health outcomes and policy, had no idea that one of her students, Mickey Emmanuel, had seen a call for nominations for the Local Hero Award from the American Academy of Pediatrics. Emmanuel said she thought of Thompson because she was moved by her presence and ability to empower others. “I just felt that Dr. Thompson was right for this because of all of her work to improve the lives of people in the community who don’t necessarily have as many resources as others,” she said. When Thompson learned that she had been nominated for the award, she said she was unbelievably touched. She was especially humbled by the letters of support in the nomination package, which came from students, parents of children she had treated and even her boss. After reading the letters to her children, they asked her if she thought she would win the award. “I already did,” she replied. Thompson hadn’t thought much about the nomination until one day over the summer when she was checking her email and saw one with the subject line: Congratulations! She grabbed a close friend and shared the news that she was a new Local Hero. At the award ceremony in Chicago, Thompson had her own cheering section. When Thompson was in medical school, she thought she would be an OB/GYN or a surgeon. But she had an “aha’’ moment that she was meant to go into pediatrics, and she has never looked back. Thompson completed her residency and research fellowship at Dartmouth-Hitchcock Medical Center, then moved to New York City. She said she wanted to work in an academic setting that focused on narrowing health disparities, so UF was an excellent fit. She said in pediatrics, there is no one model that you have to fit. Thompson is a general pediatrician, so she works with patients and trains residents at the UF College of Medicine. “I really love the primary care aspect of medicine; I find teaching residents inspiring and I also get to do research,” she said. Undergraduates, graduate students, residents, fellows, peers and other colleagues approach Thompson’s research team when they have an idea. “We help mold it into a research question, a research idea and ultimately a research outcome,” she said. 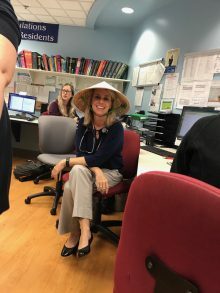 Thompson said the many roles she fills at UF feed off of one another.“When I am in clinic, sitting with my peers, I’m often seen as the researcher,” she said. Other times, like at UF’s Institute for Child Health Policy, she is the clinician. “I’m the one who can be more realistic about some of my colleagues who might have this unbelievably great idea, but it’s not going to work in clinic,” she said. She also trains residents at the pediatrics department’s Continuity Clinic, which she said keeps her on her toes. “Watching someone from day 1 through almost three years, where they are able to manage a complex panel of patients on their own and they are ready to graduate, is a wonderful evolution to see,” she said. Where some might get dizzy trying to keep all of the balls in the air, Thompson embraces the challenges. “The most fun is over these 15 years I haven’t figured out what I’m going to be when I grow up,” she said.